Manchester United’s defeat to Olympiacos in the Champions League, making them 2/1 shots to qualify, paved the way for Roy Keane to deliver a passionate performance in punditry, in typically snarling fashion. Stewart Downing’s half-time joviality really got Keane’s goat during West Ham’s 5-0 defeat to Nottingham Forest this season. Michael Carrick fronted up after the Olympiacos debacle without really offering too much explanation for United’s performance. For Keane it was a bridge too far after watching a game where the Old Trafford club lacked “urgency”. 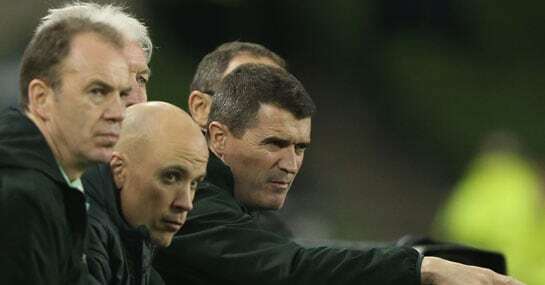 Ireland’s perfomance, both on the pitch and in the stands, infuriated Keane during Euro 2012. So many fantastic Keane-isms came in the aftermath of watching his country lose 4-0 to Spain that there just really isn’t space for them all. Keane: Poor goalkeeping, his form was poor last year. Look, I think everyone thinks I’m on the goalkeepers back..
Keane Listen it’s football, the ball is gonna move! It’s straight down the middle! When Nani was sent off in last season’s Champions League it caused uproar, ironically though, Keane agreed with the decision. The ensuing debate between Keane, Lee Dixon and Gareth Southgate was compelling not least for Keane’s reaction to Southgate’s assertion that Nani wasn’t aware of Alvaro Arbelloa’s presence.